It is good to see that the consumers are becoming aware and sensitive about the quality of drinking water supplied in their area. The consumers in Balkumari Lalitpur have shown that they are concerned about the quality of drinking water supplied in their area by the Kathmandu Upatyaka Khanepani Limited (KUKL). The consumers made the quality test of the tube well water supplied by KUKL in their area and the water was found to be highly contaminated with ammonia far exceeding the national and international standards. The consumers have really done a good job by calling the concerned KUKL officials for an interaction to discuss on the serious matter. This shows that the consumers are becoming more aware and alert on water quality and services. On the other hand, the KUKL should also maintain the standard of drinking water supplied to the consumers. Lalitpur: It has been made public that the drinking water supplied in Balkumari area of Lalitpur is not fit for drinking. Environment and Public Health Organization in the initiation of NGO Forum for Urban Water and Sanitation had conducted water analysis of drinking water supplied in Balkumari area of Lalitpur and the water analysis report was shared amidst an interaction programme organized jointly by Newa Rajnitik Abhiyan, Lalitpur Nagarik Abhiyan and Balkumari Conservation and Improvement Committee. Kathmandu: An official of Kathmandu Upatyaka Khanepani Limited (KUKL) has threatened to discontinue water supply if the KUKL has to face action for supplying water of sub standard quality to the consumers. Acting General Manager of KUKL Kiran Prakash Amatya has threatened to discontinue water supply from the treatment plant at UN Park of Jwagal Lalitpur if any action is taken against the employees of the Jwagal branch. Kathmandu: Bimala Bardewa stands by her fragile cement block home on the riverbank, directing her children as they prepare for school and ignoring the stench which rises from the fetid water below. Her 50-year-old husband Badri Pariyar, a lower-caste Dalit, cleans the traditional flute-like instrument that he plays at wedding parties to put food on the table for his family-of-five. Kathmandu: Prime Minister Baburam Bhattarai has listed more than a dozen infrastructure projects as “national pride” in the Immediate Action Plan (IAP) unveiled last Thursday and set ambitious targets to complete them. Despite the prime minister’s grand plan for infrastructure development, the country’s high-priority infrastructure projects are moving ahead slowly, according to the Finance Ministry’s half-yearly review of the annual budget. Kathmandu: The Asian Development Bank (ADB) is selling its second Water Bond to Japanese investors to help finance its work in the water sector. The Water Bond, denominated in Turkish lira, will be issued in February. ADB will provide assistance in an amount at least equal to the net proceeds of the bond to water-related projects in the region, such as new water supply systems in urban areas, major rehabilitation of existing irrigation systems, and investment in wastewater management. Kathmandu: A monitoring team, which conducted a monitoring visit to the water treatment plant of Kathmandu Upatyaka Khanepani Limited (KUKL) at Jwagal Lalitpur on Wednesday, has revealed that the treatment plant has been supplying untreated water to the consumers. The drinking water being supplied by the treatment plant looks like sewer. Kathmandu: The government is all set to launch a programme in municipalities to cut down on waste going to landfill sites by adopting a policy to segregate and recycle waste and produce compost. The European Commission-supported programme, Towards Zero Waste in South Asia, will be implemented in Tansen and Hetauda municipalities this fiscal, said the Municipal Association of Nepal (MuAN). Kathmandu: The Kathmandu Upatyaka Khanepani Limited (KUKL) is preparing to supply six million liters of additional water every day within a month to alleviate drinking water scarcity in the capital. But the Valley folks will still not see much change in the schedule of distribution. KUKL supplies water every fourth or fifth day for an hour and the supply comes down to once a week during the dry season. Kathmandu: Softening its stand on the much-talked about eviction of squatters under pressure from various quarters, the government is likely to provide Rs 5,000 per month in house rent to each real landless family. A meeting of the taskforce formed to evict the people residing on the encroached river banks in the Kathmandu Valley with Home Minister Bijay Kumar Gachhadar on Saturday had decided to pay house rents to those who have registered themselves as the real landless people. Kathmandu: The Kathmandu Upatyaka Khanepani Limited (KUKL) is preparing to supply additional 5 million litres of water daily to ease the shortage of drinking water in the Kathmandu Valley. According to KUKL Spokesperson Suresh Acharya, KUKL is installing deep tube wells in Shital Niwas (presidential residence), Prime Minister Residence at Baluwatar, minister quarters at Pulchowk, Singha Darbur, Satdobato (Lalitpur) and Sankha Park (Maharajgunj) to supply additional drinking water. Kathmandu: Hazardous and infectious waste produced by hospitals is still being mixed with municipal waste, causing serious threat to human health. According to the Ministry of Health and Population (MoHP), around 4,300 metric tonnes of waste is produced annually by hospitals, clinics, health centres and health posts. About 20 per cent of it is infectious and very harmful. Kathmandu: The government has loosen purse strings for squatters by deciding to pay house rents to those who have registered themselves as the landless people. A meeting of the taskforce formed to evict the people residing on the encroached banks of rivers of the Valley with Home Minister Bijay Kumar Gachhadar on Saturday made the decision to this effect. Kathmandu: Saharan Manandhar, a local vendor at the Pashupatinath temple, used to bundle purchases into black polyethylene bags and hand out to his customers. For years visitors bought souvenirs from the 20-year-old’s shop and filled up on plastic bags, posing a serious threat to the environment. However, Manandhar is seeking out environmentally friendly alternatives nowadays. Bhaktapur: Bhaktapur is reeling under shortage of drinking water after the Kathmandu Upatyaka Khanepani Limited (KUKL) supplied only half of the total water demand in Bhaktapur. 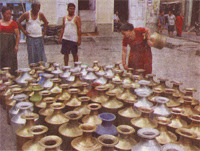 The daily water demand in Bhaktapur is around 8 million litres. However, the KUKL hardly supplies only 4 million litres of water at present. Kathmandu: The Kathmandu Upatyaka Khanepani Limited (KUKL) is all set to supply additional 15 million litres of water daily within the next nine months. The KUKL has aimed to add 15 million litres of water in the existing water supply system to fulfill the daily water demand in the Kathmandu Valley until the completion of the Melamchi Water Supply Project. Butwal: In a bid to address water scarcity of the district for a long term, the work of supplying water of Jhumsa Khola to Butwal under the Butwal Drinking Water Improvement Project has reached to its final stage. A total of Rs. 200 million has been estimated for the project which would be provided by the government as a loan and through internal sources of Nepal Water Supply Corporation. Salyan: Locals of Kupindedaha and Nigalchula in Salyan have initiated a campaign to collect rainwater as an alternative source of drinking water due to acute shortage of water. The compulsion to walk five hours distance a day to fetch drinking water has been ended with the feasibility of collecting rainwater as an alternative source through the use of bio-gas, locals said. Bajhang: Most of the houses in the district have toilets and drinking water facilities, but the irony is that Bajhang District Development Committee, the office that regulates these programmes, is devoid of these facilities, thanks to the negligence of DDC officials and district-level political leaders. This is in reference to the editorial “Hospital wastes” (THT, Feb. 1, Page 8). It is rather shocking to learn how different hospitals in the capital are indulging in immoral and irresponsible act of dumping hospital waste in an erratic manner. Only increasing the number of health institutions does not guarantee effective health service delivery unless they abide by the rules and laws set by the government, without compromising on quality. It’s a really sad and serious matter “Hospital waste posing health hazard” (THT, Jan. 31, Page 3). It’s a matter of concern for everyone. The wastes produced by the hospitals are more dangerous than any other type of waste produced by the other sectors of the country. One has only to go out early in the morning, and you see small heaps of garbage on the side paths all over the city. What is surprising is that you find garbage strewn around the dustbins while the dustbins are empty. And the municipal workers don't complain while they go about in their carts or trucks picking up the strewn garbage along the streets and lanes of Kathmandu. Once again the public toilets in the capital city Kathmandu have come into the limelight but all for the bad reasons. The city lacks public toilets according to the population density, and still worse many existing toilets are in pitiable condition and lack the basic facilities of a public toilet. No wonder many public toilets emit odious stench due to lack of regular cleaning and maintenance. Most of the hospitals are not managing their wastes well. This poses a serious health hazard as it is found that five to 30 per cent of the infection among patients can be attributed to hospital wastes, which is found to be mixed with municipal waste. Although there are laws for punishing hospitals not managing their wastes properly, it seems that they are not being heeded. Champa Kamal sits in front of her home, holding her children. She won’t let them go to school – she’s afraid the bulldozers might come while they are away and they would get separated. With constant threats to raze the homes along Kathmandu’s Bagmati River where Kamal lives, she sits day after day with her children in her lap, waiting. For seven years, Suman Shakya struggled to deal with water scarcity at home, a story most Valley residents will relate to. But the tables have turned, and today, it has become his business among many to advocate feasible models of dealing with water scarcity. “Back then, I thought of investing in something which was durable and sustainable,” says Shakya, who earlier used to spend Rs 2,800 each month to purchase 24,000 liters of tanker-delivered water. People do not realize that solid waste reduction and recycling helps in addressing global climate change. They are not aware that the trash they toss away leads to emissions of greenhouse gases. Each kilo of trash tossed emits approximately 200 grams of carbon dioxide in the form of methane. Reuse and recycling of materials can reduce emissions by reducing the amount of methane generating waste sent to landfill site.